Red Bull KTM’s Toby Price has claimed his second Dakar title today with a convincing stage win. 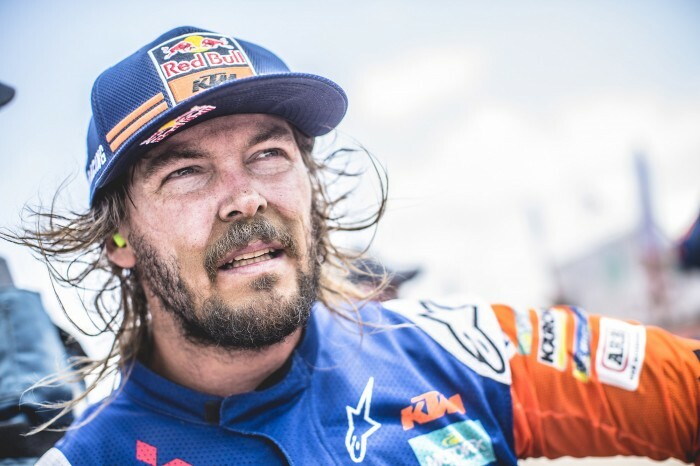 Price has been carrying a wrist injury for the last few stages but has put that out of his mind to take KTM’s 18 Dakar win. Britain’s Sam Sunderland stood on the podium with his team-mate. “It feels amazing to stand here knowing I have won the Dakar, I don’t think it has really sunk in yet. I thought at the beginning of the event I would be lucky to even make the rest day. My Red Bull KTM bike has been amazing, I want to say a big thank you to my mechanic for that,” said Price. “The whole crew here do an amazing job – without them I would be no one. The team put in so much work on the lead up to the event and when we get here it’s down to me out there on the track so it feels amazing to be able to reward them all with this result and keep KTM’s winning streak going. “It was so tight going into the stage this morning, both Pablo and I knew we would have to push right from the start. Unfortunately for him, he went too hard off a dune but he really deserves a win too – everyone that starts this race deserves a win.